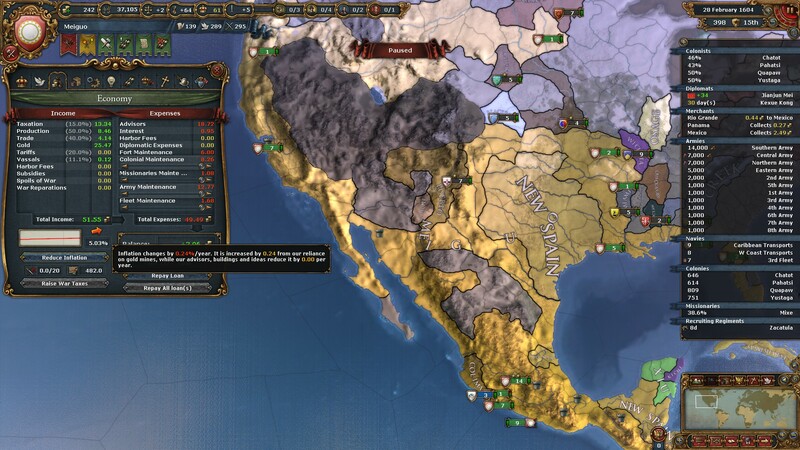 In the three months since I departed Your Majesty’s presence, I have travelled first to our colony of New Spain, then thousands of miles north overland. I write to you now from the court of Meiguo, on the shores of another sea. Like ourselves, the rulers of Meiguo are not native to the New World. They trace their ancestry to a deposed emperor of China, who fled his home near two centuries ago. Since arriving, they have extended their reach far south and east: they abut our colonies in Mexico, and also along the Rio Grande. While Meiguo’s domains are vast, they are sparsely populated. 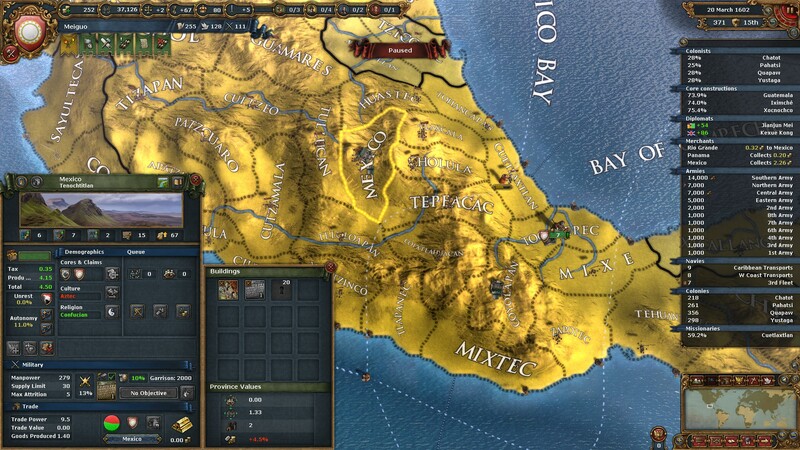 I saw few towns during our journey north; I will be surprised if these lands contribute much to the Meiguo purse. … and the far sparser economic map. Most of my provinces are 1-1-1, producing minimal income and manpower – a pretty cool depiction of a ‘big but sparsely populated’ land. The exceptions fall into three categories. First, the garrison towns, protected by castles such as those from which our ancestors fought. While I understand the lord of Meiguo plans to modernise his forts, this has not been evident so far. 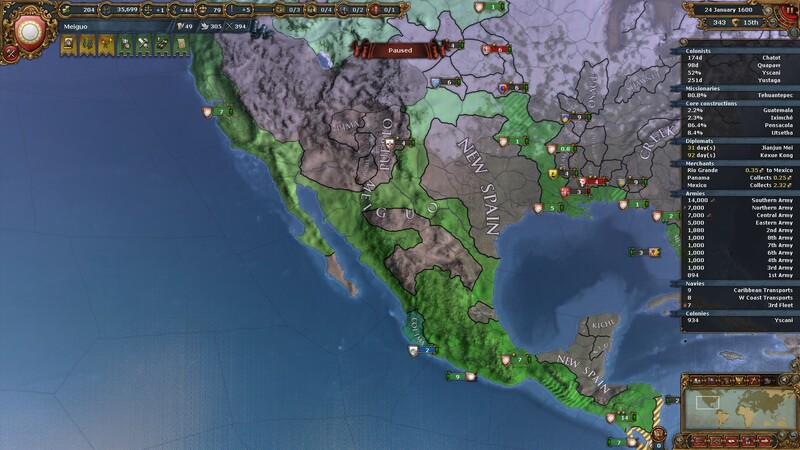 The green provinces are those with forts. I have just unlocked the technology to build the second tier of forts. 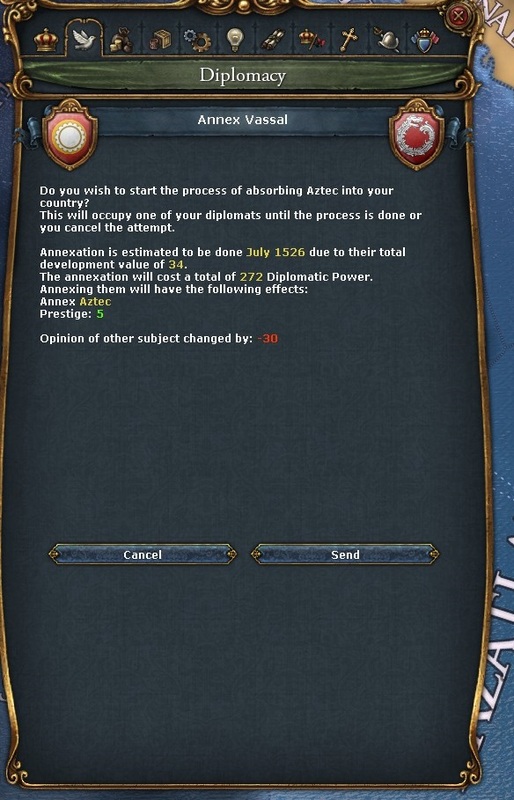 I will upgrade my existing forts as money permits. 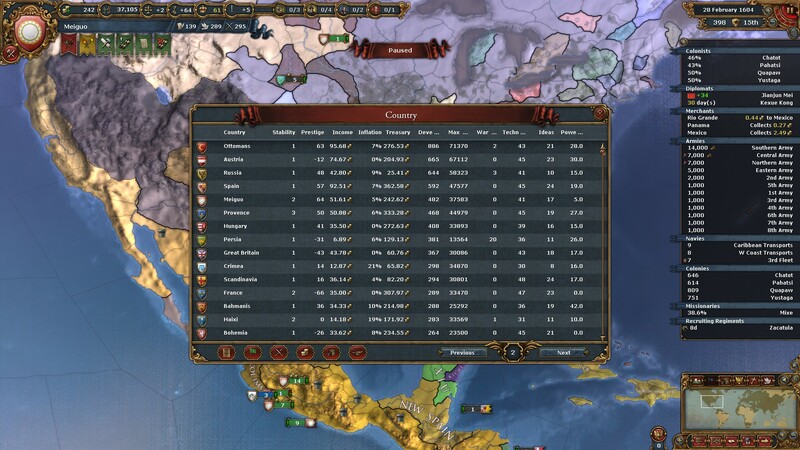 With so many 1-1-1 provinces in my empire, gold — and the resulting inflation! — has been a necessary evil. 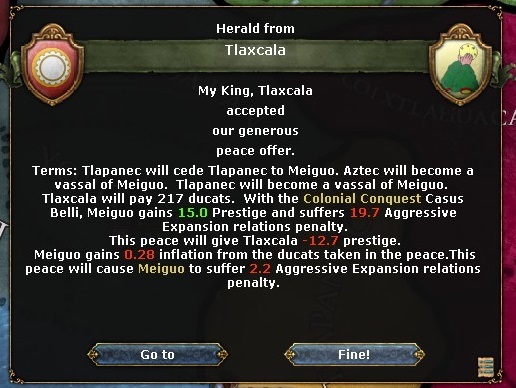 … and by now, those lands are full parts of the Meiguo empire. For now, neither party looks likely to start a war. Portugal lacks the strength, and conversely, our recent alliance with Portugal should deter adventurism on Meiguo’s part. Nonetheless, I urge caution. 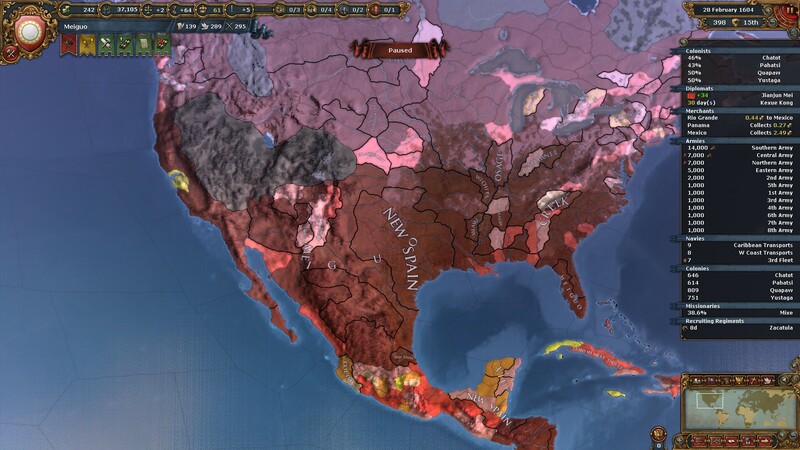 Meiguo continues to extend its rule across the New World. 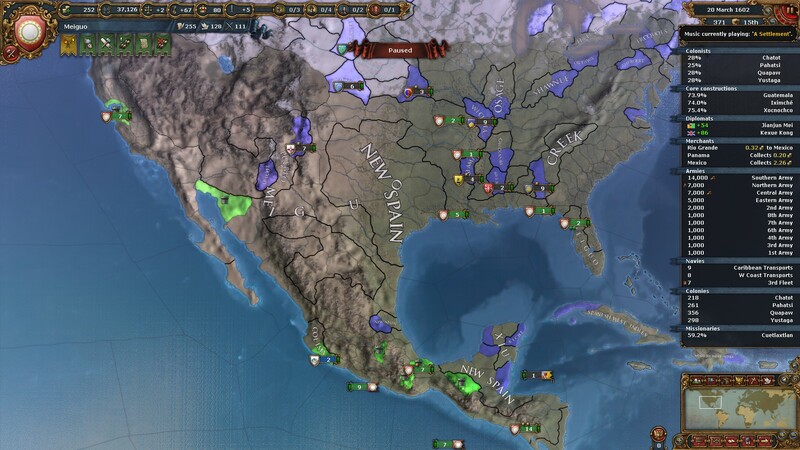 It will not be easy for them to defend so vast an empire, but already, they pose a potential threat to New Spain. Perhaps one day, they may emerge as a threat to Spain itself. Yes, that is Provence doing better than France! Really enjoying this one so far. Fun premise. Thanks, glad you like it! I’m hoping to update once real life lets up. Welcome to Matchsticks for my Eyes, a site about stories, strategy games, and soundtracks.